Indian Filmmaker Exploiting Sania Mirza’s Picture Is Extremely Disrespectful! 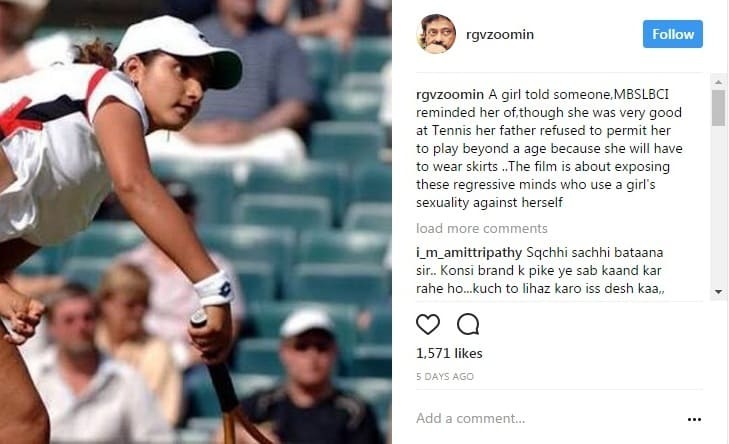 The Bollywood filmmaker, Ram Gopal Verma who is mostly infamous for his nasty and unacceptable comments on women shared a picture of Indian tennis player Sania Mirza (who is also the wife of Pakistani cricketer Shoaib Malik) while playing Tennis and hence her inners are visible. The fact that out of a thousand pictures of one of India’s most celebrated players, he decided to use an offensive photo without her permission to gain attention is absolutely disgusting. Sharing such an offensive picture of anyone especially a woman is definitely unacceptable. Ram Gopal Verma really needs to respect an individual’s privacy, he’s getting thrashed on social media fo sharing a pic of Sania without her consent. P.s. I’ve cropped the original post by RGV due to explicit content.